Sturgis, SD (September 2013) – A custom Harley Davidson helped raise a record donation for charity during the Biker Belles® auction on Aug. 6, 2013 at the Sturgis Buffalo Chip®. The one-of-a-kind motorcycle, donated by Bruce Rossmeyer’s Daytona Harley Davidson, was customized by moto-celebrity, Jessi Combs, for the Velocity television show, “All Girls Garage.” The program features female mechanics repairing and upgrading classic automobiles and motorcycles, and during its Friday, Sept. 14 episode, it will spotlight both the Buffalo Chip’s Biker Belles celebration and this custom Harley. In the upcoming episode of All Girls Garage, Jessi Combs highlights the reasons why the Biker Belles charity ride is of particular interest—celebrating women and the role they play in shaping the culture, sport, art and history of motorcycling. Proceeds from the event for which Jessi customized the bike benefit two local charities: Helping with Horsepower and the Sturgis Motorcycle Museum and Hall of Fame. On Sept. 14, viewers can see exclusive footage of Jessi leading the Biker Belles ride through the scenic Black Hills on the Softail Slim she customized for the show. The 2013 Biker Belles event began at the Lodge at Deadwood with an inspiring symposium of leading industry women. 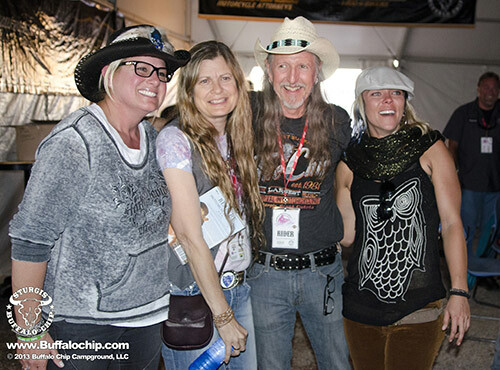 The day-long event then ended at the Sturgis Buffalo Chip with a special catered reception, a fashion show featuring Harley Davidson MotorClothes® and a live and silent auction. The auction featured an array of tempting items, but the All Girls Garage customized Harley was the prize everyone had their eye on. When bidding came to a close, it was Pat Simmons of the Doobie Brothers that held the winning bid. The guitar legend and motorcycle enthusiast explained that he purchased the custom Harley Davidson as a present for his wife. Including Simmons’ purchase, the Biker Belles auction raised over $36,000 for the two charities. To see this remarkable bike and highlights from the Biker Belles celebration, watch Jessi Combs host All Girls Garage on Velocity, at 11:30 a.m. ET/PT, Sept. 14. For more information about the Biker Belles celebration and to reserve your place in 2014, visit www.bikerbelles.com or call 605-347-9000. Special thanks to co-owner of Bruce Rossmeyer’s Daytona Harley Davidson, Shelly Rossmeyer; Motorcycle Hall of Famer, Cris Sommer-Simmons; safety advocate, Vicki Roberts-Sanfelipo; Brand Director of Advanstar Communications Powersports Group, Tigra Tsujikawa; Trish Horstman of Baker Drive Train and celebrity rider, Kristy Swanson. Without their support and dedication to motorcycling, this event would not have been possible.